I received book for review from Insight Editions. The opinions within this post are of my own and I was not influenced in any way. Please do your own research before purchasing products or using services. Your opinions and results may differ. Meet "zebrapotamus" Hector. He's not like the other hippos in the jungle. His unusual black-and-white striped skin makes him the target of hurtful teasing from the other hippos on the riverbank. But when a chance encounter opens Hector's eyes to true friendship, he begins to appreciate qualities of character he never knew he had. And when dangerous circumstances put him to the test, he proves just how powerful kindness can be. Beautifully illustrated in rich watercolors, this poignant story underscores the values of forgiveness and respect for differences, and the need to see beyond external appearances-important messages for young minds growing up in a globally aware era. 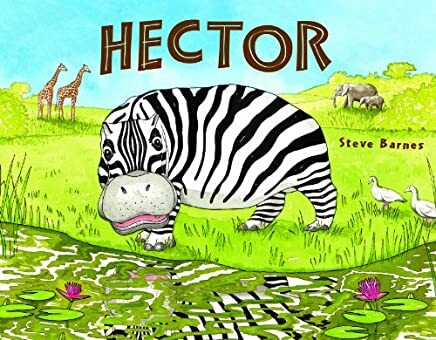 A hardback book with watercolor illustrations, Hector tells of a hippo with zebra stripes. He is taunted by his fellow herd of hippos for not looking like them. Hector goes through sad emotions as he tries to find his place in life. He happens upon a pack of zebras and is accepted by them. One day, Hector comes across a situation where he uses bravery, and he saves some baby hippos from danger. The other hippos realize that Hector is one of them and they want him back in their herd. Told in rhythmic form, Hector is a choice book to teach young children about forgiveness, kindness, and acceptance. One person will win a book copy of Hector. I'd like to read How to Knock Out Nightmares with my grandsons, too! I would like the bee book. I would like to read Bee because my granddaughter is fascinated by bees. I would like to get the Harry Potter-pop-up book. I'd like to read How to Demolish Dinosaurs to my grandson. I'd like to read Bee because children need to read non-fiction, too! I think the book, I've Never Met an Idiot on the River, would be a great gift for my husband. I think he'd really enjoy it! I'd like to read The Kiss: A Celebration. I like Bug Life, looks very educational. I'd like to read Fringe: September's Notebook. I'd like to have The Dark Knight Manual! I would like to read Whose Nest?to my son. Bart Simpson's Manual Of Mischief looks very interesting!